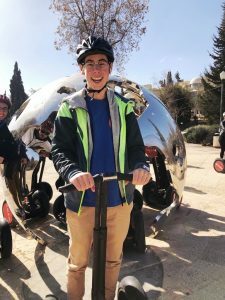 The Jerusalem students took a Segway tour through Jerusalem, a great way to see an ancient city using today’s modern technology. When first stepping on to a Segway you feel may feel a bit unsure but within a few minutes your body learns the motions and driving a Segway becomes intuitive. By the end of the tour we were confidently riding past beautiful views and enjoying the ride. Our students learned about the different quarters, such as the Jewish quarter, the Muslim quarter, the Christian quarter and the Armenian quarter. From there we Segwayed to King David’s grave, and paid tribute to one of the Jewish Kings. We also saw the Churva Synagogue that has been rebuilt 4 times over the years.